Riverview Farm is the home of our Pedigree flock of Welsh Black Mountain Sheep. Welsh Black Mountain sheep are the only pure black sheep & there are over 60 different breeds of sheep in Britain! Our sheep are reared on the traditional, species-rich pastures at Riverview Farm – we do not use any chemicals or sprays on our land. They graze the pasture and browse the brambles and hedgerows helping to keep the rich diversity of flora and fauna around the farm. They are easy to keep, make excellent mothers and produce very lean, tasty meat which is very low in fat. Our lambs are born outside and are very quick to their feet – we only bring them indoors if the weather is particularly bad. We are a high health status closed flock – which means we have healthy sheep and our own replacement ewe lambs join our flock. Our animals are all Farm Assured with the Red Tractor Scheme and we are inspected annually to ensure that we adhere to the highest standards of animal welfare. 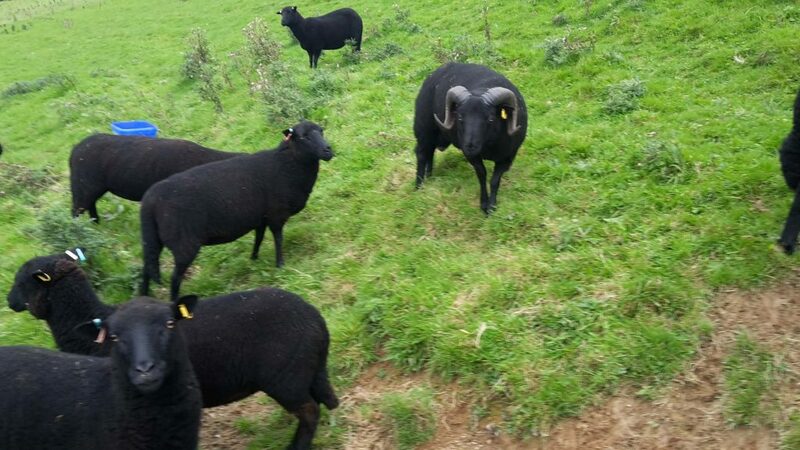 Black Welsh Mountain Sheep are an ideal breed for smallholders and people who want an easy-care sheep with a lot of character! We sell our surplus ewes and can supply a small starter flock with unrelated ram. Store lambs are also available. We are always happy to answer questions and offer advice. Riverview Farm meat boxes are available during autumn and pre-orders can be taken any time. Meat is delivered vacuum packed ready for the freezer by refrigerated courier to anywhere in the country and we supply either a whole or half lamb. A half lamb fits into a draw of the average freezer. A standard pack includes both joints, chops and mince although as we offer a bespoke service we can meet the specific requirements of our customers. If there is anything we can help you with please contact Angela by calling 01503 262454 or using the contact form here.